Fairtrade Gold is an artisanal product of small-scale miners—whose primary tools are generally the shovel and pick. For Fairtrade Gold, environmental and labor conditions are audited— and this gold is transparently traceable directly to the community that mines it. Fairtrade Gold also provides a social premium that allows miners to improve quality-of-life conditions for themselves and others in their communities. Fairtrade Gold has one other advantage. 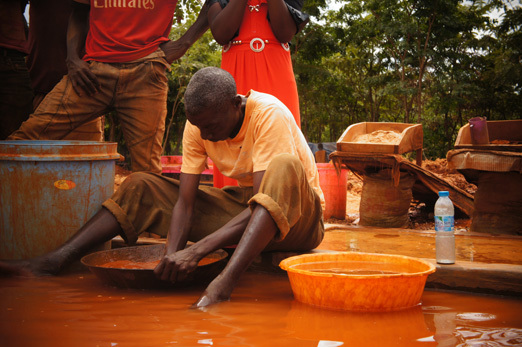 Unlike other ethical gold from small-scale miners, the jeweler’s use of gold is also audited. This auditing is part of the contractual arrangement with Fairtrade International that allows the jeweler use of its logo, a widely respected brand. "Essentially, when you add up the Fairtrade premiums, import charges, supply house upcharges, and auditing fees, Fairtrade Gold costs about 20% more than recycled gold." The bottom line: with Fairtrade Gold, the people of the land control and benefit from the resources of the land. And you as a consumer can be completely confident that you are making a huge difference to certified mining communities and purchasing the most precious gold in the world. However, Fairtrade Gold does cost more than ‘dirty gold’ or ‘greenwashed’ recycled gold. If gold were $1000 an ounce, recycled/dirty gold from your typical jeweler costs the jeweler $1020 per ounce. Fairtrade Gold costs $1200 to $1250 per ounce. Here is a ‘back of the envelope’ calculation. The numbers vary according to circumstances, and I have also rounded number so we’re not dealing with fractions in the total. Nevertheless, the figures still give you a close approximation of the actual costing. It all starts with daily spot price, the international ‘fix’ which determines the pricing at any given moment. 99%: Gold purchased from miners at daily spot price. + 5% = 104%: Fairtrade premium. + 1% = 105%: Shipping charges. + 1% = 106%: Charge from refiner to bring the gold from miners to .999 pure. + 2% = 108%: Charge from importer. + 9% to 14% = 117% to 122% : Up-charge from metal supply house to jeweler. + 4% = 121% to 126%: FLOCert charges for auditing supply chain. Read on for a more detailed explanation of this costing, and for more background information. Gold for jewelry comes from large and small-scale mining, as well as other sources such as recycled electronics and jewelry. This gold is sold to jewelry manufacturers at a small percentage above or below daily spot price, depending upon the volume. In selling recycled or mined gold to jewelers, an average gold dealer takes 2% as a commission. For example, if gold were $1000 an ounce, a jeweler might pay $1020 per ounce. Again, this percentage can vary according to volume. Whether gold is newly mined or from recycled sources does not affect its price. Recycled gold is basically the brother of ‘Dirty Gold.’ It comes electronics or old jewelry originally was sourced from dirty gold mines. It is simply refined and rebranded as ‘eco-gold.’ Unlike Fairtrade Gold, is not an environmental or socially-responsible choice, because it does not reduce in any way the mining currently taking place. Fairtrade Gold comes from small-scale mining, which generates about 20% of the world’s gold supply. Mercury binds to the gold in the dirt and water. This photo shows gold mixed with mercury that remained from the process shown in the previous photo. This miner will probably take this mercury and burn it off in a frying pan, creating methylmercury, one of the most dangerous neurotoxins known to man. Small-scale gold mining is the world’s largest contributor of anthropogenic mercury emissions (37%) in the world. Mercury toxification is just one of the major concerns about unregulated small-scale gold mining, which makes up about 90% of the world’s gold mining labor. Small-scale gold mining is very labor intensive, as this photo taken of a mine in Tanzania shows. Small-scale miners typically live and work in remote areas, and usually have no way of determining how much their gold is worth. As a result, a small-scale miner will often sell the gold he or she gathers after a few days of hard work for just 70% of its international value. This is often because these miners simply don’t know the spot price. Even if they do, the gold they mine is not pure (.999) gold, but a mixture of gold and other metals, such as silver or even platinum. The small-scale miner does not have the technical ability to analyze the purity of his or her gold. Plus, because the quantity of gold being sold is small, this often means less money to miners than if they were selling in volume. As a result, small-scale miners are locked into a poverty cycle. They do not make enough to do anything but survive. Small-scale mining has excellent potential for alleviating poverty if the miners can be supported to mine responsibly. Under the Fairtrade Gold system, gold is purchased from small-scale miners for 95% to 98% of its international spot value, rather than just 70%. Also, the gold is accumulated until there is a level of volume which makes it viable to import. The hand-to-mouth cycle of selling a few dollars worth of gold as soon as it is mined is broken. Miners receive a salary for their work in their small-scale mining organization, which can be a cooperative or a small business. Additionally, there is a premium of $2000 per kilo of gold paid directly to the mining community. How this premium is used in the community is determined democratically. In Sotrami, where we at Reflective Jewelry have purchased much of our Fairtrade Gold, the premium has been used for elder care, computers, and to open a community market. 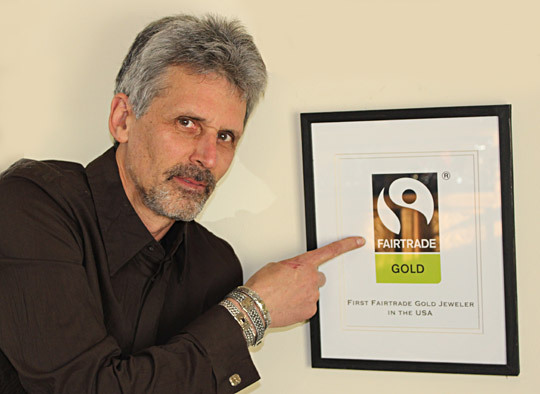 Marc Choyt, President of Reflective Jewelry, poses with his Fairtrade Gold certification. Now that you understand a little bit about the process of Fairtrade Gold versus other gold offered on the market, we can expand on what we mentioned at the onset of this article— the breakdown of pricing. We start with the cost of gold being purchased from the mine, and add percentage points to that spot price as the gold reaches the small jeweler. 99%: Gold purchased from miners at daily spot price. This is what the miners are charging the importers. + 5% = 104%: This is for the for the Fairtrade premium. A kilo of gold at spot price (at the time of this article being written) is approximately $42,000. The $2000 premium increases the price of gold from the mine by almost 5%. So, someone purchasing Fairtrade Gold from a mine in volume might end up paying 103% of spot price to the miners. + 1% = 105%: Shipping charges. This is what it costs, approximately, to ship and export. But this is just an estimate. The cost can go up or down, depending on the volume of the import. + 1% = 106%: Refining costs. Remember, gold from a mine is not pure gold. It’s mixed with other metals. This is the charge of the refiner to bring the gold from miners to .999 pure. + 2% = 109%: Charge from importer, who goes through all the paperwork and hassle to bring the gold into the EU or USA. This is an extremely difficult logistical challenge. It involves relationships with the miners, and setting up contacts with the right brokerage houses. Initially, it is a money-losing proposition because often the first imports are of too small a volume. + 9% to 14% = 117% to 122%: Up-charge from metal supply house to jeweler. The supply houses that sell the gold to jewelers purchase from the importer in volume and then mark up the price. + 4% = 121% to 126%: A certified Fairtrade Gold jeweler pays a $1.80-per-gram charge to FLOCert, the agency which traces Fairtrade Gold from mine to market and audits for ethical standards. FLOCert uses this money to pay for audits at the retail and mining end. There are 31 grams in a troy ounce of gold, meaning the FLOCert fee adds an additional $51 to the price of an ounce of Fairtrade Gold. If gold were $1000 an ounce, dirty gold that supplies the jewelry sector and recycled gold would sell for $1020 an ounce. Fairtrade Gold would sell for $1150 to $1240 an ounce to the average small who cannot buy in volume, purchasing from a jewelry supply house. There are additional costs for any jewelry company in handling Fairtrade Gold. Jewelers must trace Fairtrade Gold through their inventory system and track it for FLOCert. This involves a lot of extra paperwork, in addition to developing new systems that track Fairtrade Gold, keeping it separate from other gold in the system. A small jeweler also has to pay extra in casting costs. For example, a typical simple gold wedding ring can be made through mass production, but a small jeweler might have to cast a Fairtrade white gold ring as a single boutique item, which adds a lot of expense. The cost has been more than just time and money— it also manifests in stress! A lot of stress, especially when we are struggling to meet our customers’ wedding ring deadlines and hoping an item will arrive by post in time. As anyone in manufacturing can tell you, trying to implement a new product with very little supply chain or logistical support is extremely risky and stressful. We at Reflective Jewelry have absorbed these extra costs, personal and financial, because Fairtrade Gold is a powerful product and concept that we know can change the jewelry sector for the better. From a business perspective, Fairtrade Gold does not make much sense. But from every other humanistic perspective, it is the only gold that make sense. Recycled gold and newly-mined gold is the same gold. Gold mining, whether from large mines or small scale sources, creates massive environmental destruction and has terrible social costs. Fairtrade Gold offers the best chance for small scale miners to work their way out of exploitation and poverty. This equates to less mercury in our environment, empowered communities and stronger local economies. As a customer, Fairtrade Gold gives you the opportunity to purchase a wedding or engagement ring that creates a more beautiful world we all know is possible. 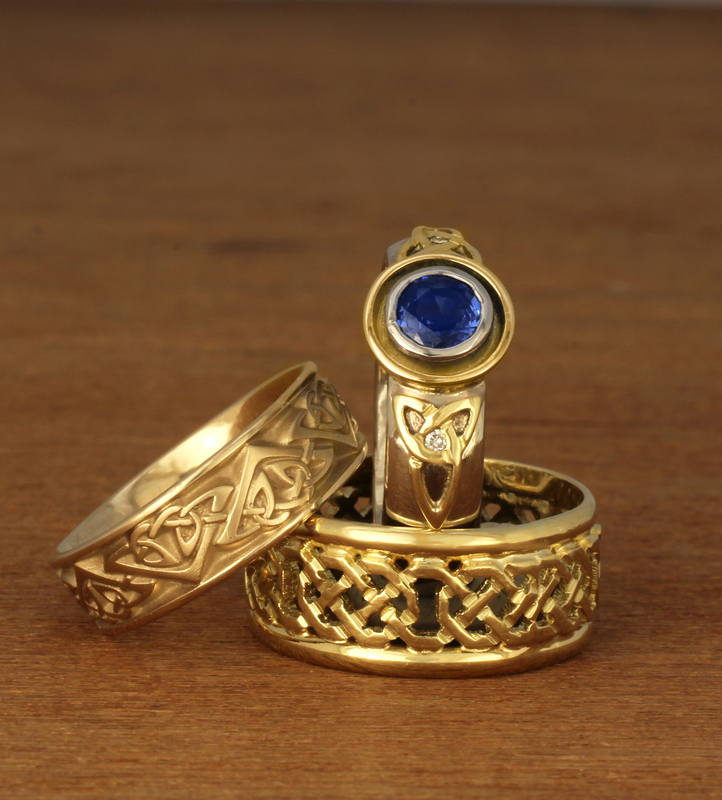 For jewelry, Fairtrade Gold is simply the best gold to use.